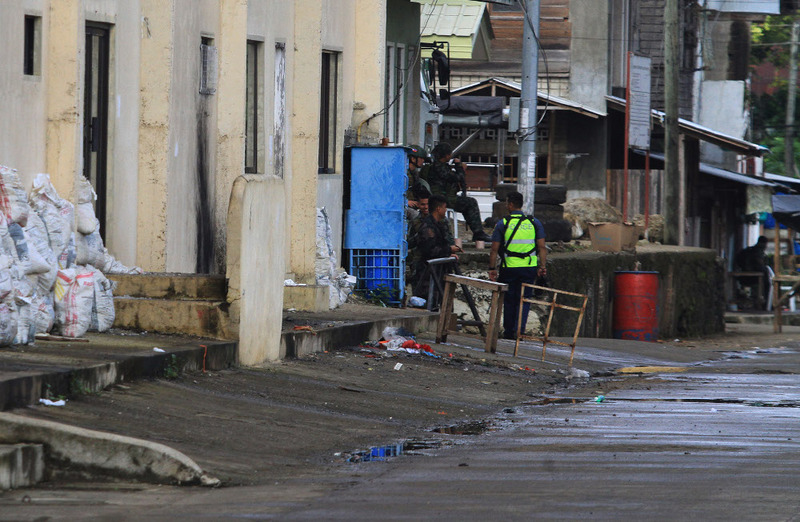 Police guard a municipal gymnasium in the town of Kauswagan in Lanao del Norte province, after an improvised bomb exploded, Feb. 6, 2019. The U.S. Embassy in Manila on Monday warned citizens to be careful while traveling in the Philippines because of the possibility of terrorist activity as the mostly Catholic country prepared for a week-long Lenten break. The advisory comes a week after troops saw intense clashes against Abu Sayyaf militants linked to the Islamic State (IS) on the southern island of Jolo, where two hostages – a Malaysian and Indonesian – were killed in rescue attempts. “The Embassy reminds U.S. citizens to exercise caution while traveling and residing in the Philippines. The holiday season is a prime time for criminal and terrorist activity,” it warned in a notice. “While victims can oftentimes ‎simply be at the wrong place at the wrong time, they can also be targeted because of a perception of affluence. Any public event that draws holiday crowds can be a target for terrorist groups seeking publicity for their cause,” it said. The advisory specifically asked people to keep a low profile, avoid walking in dark and isolated areas, and stay alert in locations frequented by western tourists. The new notice followed the U.S. announcement on April 9 introducing a new indicator on travel advisories focusing on the risk of kidnapping or hostage taking that named the Philippines and 34 other countries. National police chief Oscar Albayalde told reporters it was understandable for the U.S. to include the Philippines among 35 countries even as he sought to assure the public to remain calm. “We cannot deny that there are kidnapping incidents, especially in the southern Philippines, where there are terrorist groups so it’s normal for them to issue a security advisory for our country,” Albayalde said. Interior Secretary Eduardo Año, on the other hand, questioned the latest travel warning. “We do not know yet how they came up with the list, but with the strong stance of President Rodrigo Duterte against criminality in general, we see no basis for including us in this list. We will request from the U.S. Embassy what were the parameters used since even Malaysia and Russia were included,” Año said, referring to the list of 35. On Sunday, Philippine officials announced the U.S. confirmed that a senior Filipino militant, Owaida Marohombsar, whom the Philippines military officials had referred to as Humam Abdul Najib (alias Abu Dar) was killed in a March gun fight. Dar was among those who helped plan the Marawi siege that began in March 2017 and ended five months later with the deaths of the Maute brothers and Isnilon Hapilon, the overall IS regional leader. In addition, the Philippine military had reported that about two dozen pro-IS groups are actively recruiting members on the southern island of Mindanao to replenish their ranks following defeat at Marawi. The siege, the biggest and most audacious launched in the region, led to battles that killed 1,200 people, most of them militants. Several Southeast Asian IS militants, as well as fighters from the Middle East, joined the effort. Two weeks ago, a homemade bomb exploded at a packed restaurant in Isulan, a city in Sultan Kudarat province, about 1,441 km (900 miles) south of Manila, leaving one dead and 17 wounded. It was the latest attack since Jan. 27 when militants detonated two bombs at a Catholic church in Jolo, killing 23 people and wounding more than 100 others. The IS leadership claimed responsibility for the attack. Jeoffrey Maitem in Cotabato City, Philippines, contributed to this report.